The alarm must have been buzzing for quite some time. 9:00am on a Saturday morning in my universe is usually spent in bed watching cartoons or sleeping, ok I’ll be honest, nine times out of ten I’m still sleeping. So when I eventually convinced my arms to move I switched my alarm off and rolled out of bed. Setting an alarm on a Saturday felt sacrilegious but was for good reason, the Summit Survivor Challenge, the first trip as part of my MicroAdventure travel series across Victoria, Australia. the Summit Survivor Challenge is for you! 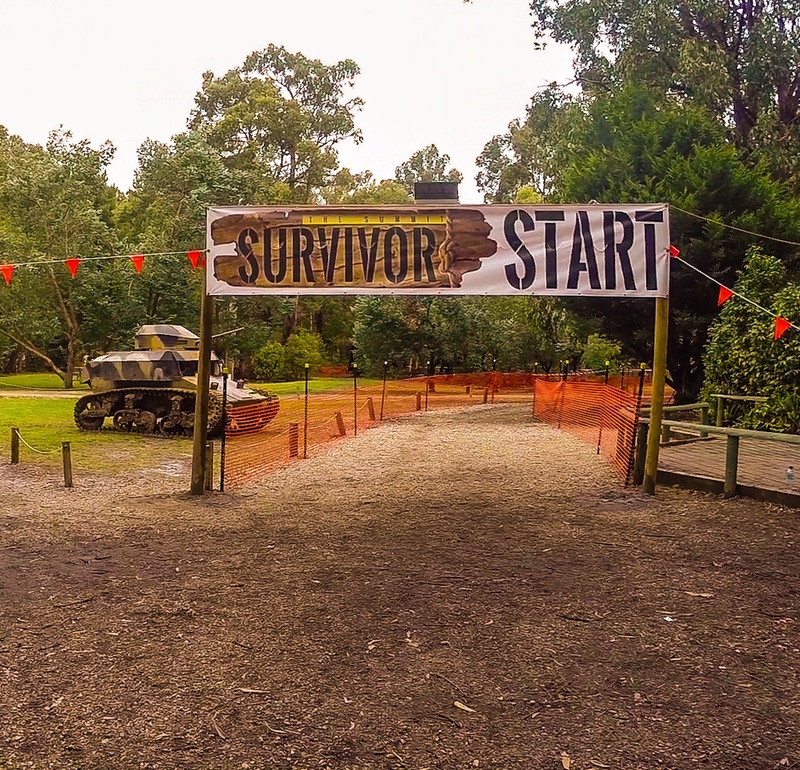 The Summit Survivor obstacle course is located in the town of Trafalgar, 90 minutes of smooth autumn driving from the Melbourne CBD. My brother and I arrived at the Summit around 11:45am. The weather was damp with a cool 16 degree Celsius chill in the air. Participants could begin as early as 8:00am that morning so people were already leaving to go home when we arrived, some looking exhausted and absolutely saturated but all with a visible glow of self-accomplishment. As I had not participated in much physical exercise or gym routine since returning from my first big adventure, walking Japan, from Sapporo to Osaka six months ago, I was not that optimistic about how well my body would fair. Nevertheless it was time to find out. So we passed them and went in, the water was cold, brown and strangely thicker in texture than I anticipated. We pulled ourselves under the mesh and made it through to the other side. Coming out of the cold water instantly put my body into heat mode and we began running to the next obstacle. The Foam Pit obstacle was a 10 foot drop down a fireman’s pole into a, you guessed it, a foam pit. I couldn’t get the theme music from Ghostbusters out of my mind as I was standing on the edge ready to slide down. I looked to the side and found a man being treated by the First Aid crew. “That doesn’t exactly instill confidence,” I said to the volunteer working for the event. “That’s what happens when you don’t listen to me and jump instead of sliding down the pole.” She replied, loud enough to make sure the injured person would overhear. To save you from boredom I will not be giving you a play by play of each obstacle of the Summit Survivor Challenge, so here are the most memorable ones for me. An obstacle consisting of a muddy pool of water that one needs to leap across in the hopes of grasping a rope wall hanging on the other side. The entertaining part of this challenge was not the obstacle itself but due to the four dudes with a picture of Jesus Christ on their T-Shirts. They appeared to be a satire ‘Team Jesus’ group, who were extremely committed to the persona. While watching most challengers attempt the leap and end up arse backwards in the mud pool I turned to one of them. “Not to worry, Jesus will catch me.” He responded with a gesture of thumbs up and a wink. Off he ran while shouting. Then, as if watching it in super slo-mo, he leapt like a gazelle and hooked onto the net like a leopard. I followed in after, all I can say about my leap was I did reach the net, dripping wet from eventually wading out of the water. One challenge that I was not looking forward to was the ice bath. Which is fairly self-explanatory, this obstacle was one of the final challenges in the Summit Survivor course but one that had the strongest physical effect on our bodies. As soon as I stepped in the pool full of what felt like 40 percent ice my body went silly and wouldn’t obey my commands. so I dropped my head down and swam under the dividing wall to make the exit on the other side. Climbing up the wall with freezing extremities was more difficult than I expected and as much as I wanted to get out fast, I needed to take it slow so I didn’t end up back in the drink. It was the first time I have acquired a brain freeze without having previously drunk anything, and to be honest I never knew you could get one without some form of cold beverage. long hair hanging off the jagged barbs. By the end of the 36 obstacle 5km course my body was surprisingly feeling better than I had anticipated. Don’t get me wrong my hands were sore, my arms were like jelly and my legs were scratched and cut but I felt great! 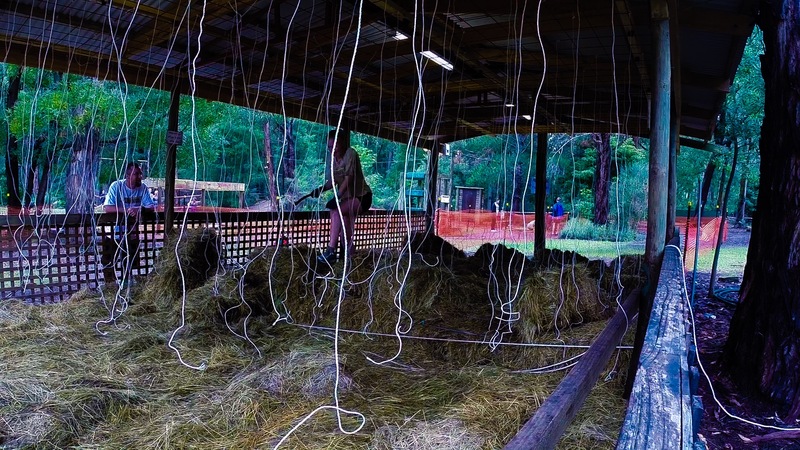 The last obstacle was certain to make every participant clean off whatever mud and dirt that had collected along the way by jumping into the lake to get to the finish line. 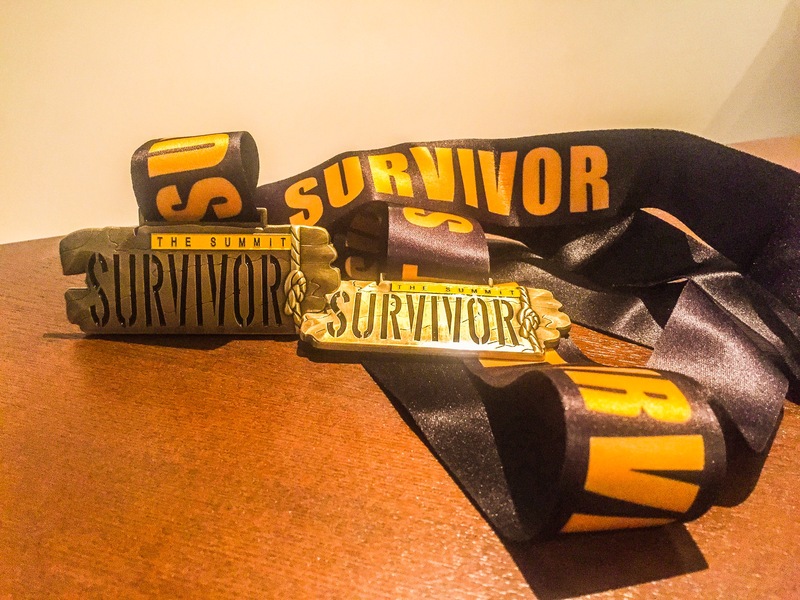 As my brother and I stepped out of the water we were greeted with individual Summit Survivor medals. The first time I have ever received a medal for anything, so I was very pleased with myself. For the sake of honesty and transparency I do have some constructive criticisms during my Summit Survivor experience, which is the slightly misleading information on their website. I was uncertain on leaving my valuables in their as advertised cloakroom, which was no more than numbered chairs under an open walled marquee. Now I understand the event is built on the hopes of good times and happy vibes but opportunists are everywhere and will gladly take a bag if the chance arises. The address on the website is spelt incorrectly, luckily Google maps was clever enough to understand where I wanted to go and this was not an issue for me, but having the address spelt correctly is a must regardless. Those were the only issues I had throughout my experience, which to be honest isn’t much. Prices for this year’s event were $99AUD per participant, plus $10AUD for compulsory insurance. It is free to spectate and picnic areas, food and drink stalls and bathroom facilities are available. In order to truly understand the experience of the Summit Survivor Challenge, you really need to try it for yourself. You do not need to be super fit or athletic. All you need is the enthusiasm. If you wish to take part in the next Summit Survivor Challenge check out their event details via their website here. My next MicroAdventure Challenge is the Kokoda Track Memorial Walk in the Dandenong Ranges. April 25th 2015 is ANZAC day in Australia and will mark the centenary of the ANZACS (Australian and New Zealand Army Corps) arrival on the shores of Gallipoli during the First World War. Where thousands of brave men lost their lives, in a country most had never heard of before landing there. As I am unable to have a Microadventure to Gallipoli on the centenary I decided to pay my respects via the Kokoda Memorial Walk. This walk pays homage to the brave Australians who lost their lives during the Second World War in Papua New Guinea. During that period, Kokoda is one of the more well-known battles fought by Australians. The terrain of the jungle, the sweltering humidity and the fear of attack from the well trained Japanese soldiers made the battle of Kokoda one of the most difficult ordeals of the war. This entry was posted on March 31, 2015 by Robb Saunders in Adventure, adventuretravel, australia, challenge, exercise, fitness, Microadventure, Travel, victoria and tagged Adventure, adventuretravel, amazing adventures, ANZAC, australia, challenge, exercise, fitness, kokoda, Microadventure, obstacle, obstacle course, Summit, summitsurvivor, Travel, victoria.